Coopers Fish and Chip shop. Hi, anyone remember me from old Portrack? My name is Jean Bowen (nee McConnell) and I was brought up by my grannie (old Martha Jones) in Campbell Street. The best and closest candidate would be the Malleable Rolling Mills. During WW1 the Malleable excelled at rolling plate for ships, and employed many workers from the surrounding streets. The Malleable was just east of Lambert Street, both were off Portrack Lane, search Malleable on this site for more information. Very interested in Ken Howell’s and George Clements comments about Lambert Street. My grandparents,George and Beatrice Hopton lived at 14,Lambert St. They had a son George who died of pneumonia aged 9 in 1916. George(father)was a labourer in the rolling mills.Does anybody remember them ? I would also like to find out what rolling mills were in this area? Sandra is right about the Teagues at Edith Place -she was my auntie. Rosie (nee Cooper) worked at the fish shop – her children Joe and Rosie are thankfully still around.Billy her eldest son died. Next door to them were the Petty”s. The tiny old lady referred to in my earlier post lived on the other corner with Lambert Street. Next door to us (No8 Edith Place) lived the Ashmans they had lived there somewhere around a hundred years – The Pinkneys were next on that side and then the Bells. I lived at 2 Edith Place from 1949 – 1954. The old lady Ken Howells mentioned may have been called Rosie and the surname Teague comes to mind. George Clements reference to 10 Lambert Street. Just opposite 13 Lambert Street lived a good friend of mine Harold Hardy I believe Harold emigrated to Australia – farther down in the house next to the back alley lived the Timms (John and Danny). On the corner house joining Edith Place (What did they call the liitle old lady who lived there, Molly ? )she had a black dog – I think she was related to the Rowntrees who lived in Nicholson Street . Freddie R was an old mate. I remember his uncle coming to light the street lights for the first time after the war – he had a procession of kids following him as he went from lamp to lamp – a big cheer went up as each one was lit. It was interesting to read Ken Howells details of his relatives living at 13 Lambert Street. My dad”s family must have been virtually opposite at No 10 Lambert Street. 13 Lambert Street – oddly enough my mother lived there as a young girl and then later my dad lived at the same address with his family (Howells), my dads sister Janet moved to Beverley Hills, California as a nanny and became quite a wealthy woman. Both my mother and father had stories of the house being haunted. My Gran died there about 1949, incidentally both my parents were tee-total. I lived at 13 Nicholson street and the Watlen”s lived at I think 28 across the road. My Dad, Jim Crammond was Baloo of the 20th Stockton Scout troop on Finkel Street in Stockton. My Mother was Akela to the cubs. Anybody remember the Brickworks where us kids used to play? I fell through the roof of one the flat tops when David Watlen, my cousin, dared me to jump across the open hole in the middle. I did”nt make it. I had to do it with my eyes closed. Any photos of 1953 portrack available? Hi Maureen, I am Michael Mcnaughton, son of Bob and veronica, I have two sisters Diane and Jacqueline and a brother Derek, are we related? I am one of Sarah Cooper”s granddaughters”, and was brought up in 64 Nicholdson St., Portrack, with my parents, John and Florence(Floss)Connor and my 11 brothers and two sisters, namely(oldest first) Joe (deceased);Stephen;David;John; myself;Kenny;Terry;Tony;Jimmy;Kevin;Sheila;Avril Peter;Brian. Floss was one of Sarah Cooper”s six daughters, and married John, the son of Michael and Maggie Connor who lived in 6, Portrack St.,. Richard Scott. I well remember the fish shop in Nicholson Street. As a boy I lived in Lambert Street and so it was not uncommon to be sent to the chippie for fish and chips. I would have thought that the demolishing of those houses was later than 1962 because I was still living in Portrack until 1963, albeit in St annes Terrace then, when I moved away on joining the army. It was shortly after “63 when my parents were re-housed to a new house on Hardwick to make way for the redevelopment of Portrack. 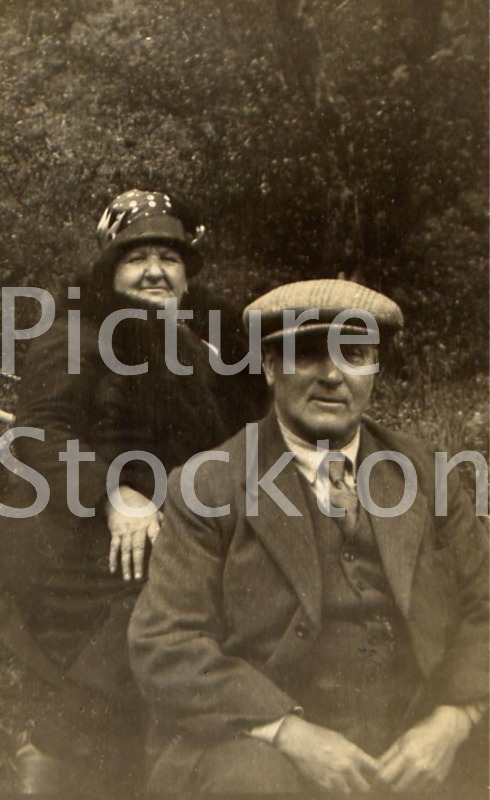 Sarah( nee Woodhouse) and David Cooper who owned a fishshop in Nicholson Street, Portrack. Sarah worked in the shop with the help of her daughters from approx.1910 until she retired, then her daughter Ivy moved into the premises and ran the shop with the help of her sisters Rose and Maria (Ria) until 1962 when the old houses in Portrach were demolished in preparation for redevelopment. Another sister Emma owned a fishshop in Bath Lane for a number of years. Coopers fish and chips were very well known in the Portrack area.